Today, please enjoy the recording of my most recent Strangerville Live story, told on stage last month, about what should be the most embarrassing experience from my childhood. And for the hearing impaired and those who hate the sound of my voice, I've included a written version and some pictures below. I was enrolled in T-ball at age five. My parents were going to make a sportsman out of me. I didn’t understand the sport, and to be honest, I was only there for the donuts. At the end of our last game of the season we were each handed a participation trophy, the only way I was ever going to be rewarded for the sports. My parents still have in their possession a picture of me holding two donuts. My participation trophy is on the ground. As you know, because you've been unable to think of anything else since, several months ago I started Strangerhood of the Traveling Snuggie. 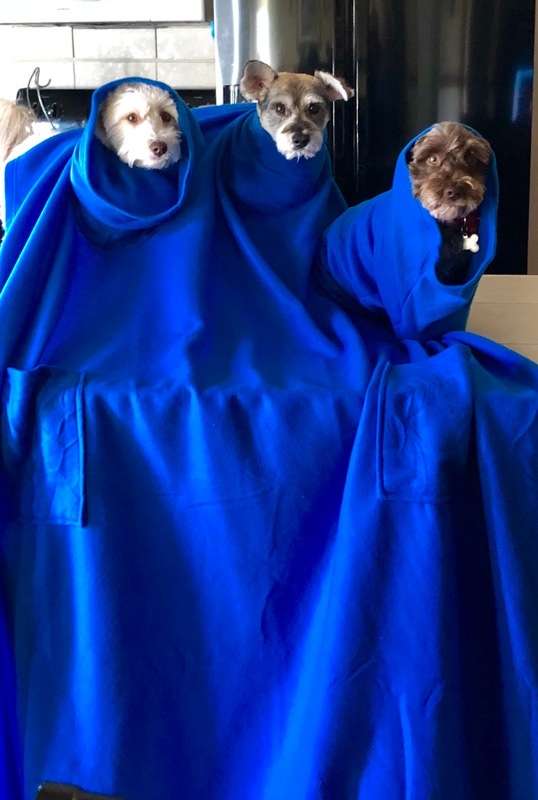 Eleventy hundred of you emailed me your personal information and asked to be added to the list, so after stealing all of your identities and running up a lot of debt in your names to continue to build my Pogs empire, I sent a blue Snuggie off on a great journey. It kind of feels like sending out Voyager 1. Every once in a while I hear that it has made it to some new place. Last I heard, that Snuggie was off in Ohio somewhere, probably confusing a lot of post office people. It has only made it to a small fraction of the Strangerhood so far, but I started feeling really selfish for keeping all of the award-winning photography I have been receiving, documenting the Snuggie's quest, to myself. So, here you are, in no particular order. I highly recommend that you open another window and let the original Nintendo theme song for Zelda play while you look at these. Athena, in West Jordan Utah. Matt is leaving this week for very Mississippi to spend a month in his hometown. You might think I made a mistake by including the word "very" in that sentence, but I assure you that I did not. If you ever heard any of his family members communicate using the English language, you would know what I'm talking about. Matt is like most of my friends in that he apparently has the ability to leave his job for entire months at a time and work remotely. Rebecca used to do this before she got knocked up. (If she reads this, she will definitely call me and object to that characterization and demand that I change it to something like "experienced God's miracle" and we'll ultimately settle on "lost her innocence"). When Rebecca was living in sin with me in 2014, out of the blue one day she told me she was moving to Paris and I didn't see her again for four months during which time zero keys to my apartment were lost BECAUSE IT'S NOT THAT HARD TO KEEP TRACK OF KEYS REBECCA. I have yelled, nay screamed, at Rebecca eleventy hundred times about losing my keys. Recently she was in Salt Lake City and told me she wanted to come hang out at my house during the day while I was at work for reasons that are still not clear to me. I hid a key for her and later found out that she lost that key literally within 30 minutes of retrieving it. In this week's Strangerville episode I may have overreacted about a thing that has been driving me crazy for a while. That thing is poorly-executed elevator small talk between coworkers. I work in a tall building that houses several companies. My firm used to be in a different building, and we shared the place with a hip ad agency so every time I got into the elevator with anyone who worked there I felt like I was in an HBO series about millenials trying to make it in New York and have it all. The ad agency employees would recount their wild weekends for one another every Monday morning, explaining how they're lucky to be alive after getting chased down by an entire gang of warlords while hunting anaconda on the moon. And I would pretend not to listen while actually very listening, because I loved hearing these stories. Two Sundays ago Gmac called to tell me that her "Faceoff is broken," which translates to "I can't log in to Facebook." I was wondering why I hadn't seen any all caps comments on my posts, detailing personal and somewhat inaccurate information about myself, in a while. Gmac is in her late 80s now, and having never been one to embrace the latest technologies with ease, we have all been pretty impressed with her shaky attempts to engage in social media over the years. I mentioned to you recently that Gmac has a very bad habit of using Bob McCann as her personal tech support, a situation which I have referred to as "the blind leading the dead." I was told that she went to Bob as her first line of defense against the broken Faceoff, and after several hours of "help," the two were in no better a position. So Gmac reached out to me. And really, she wasn't looking for my help. She was fully aware that I would then loop in Skylar and he, and he alone, would be responsible for this mess. I invited Gmac over for dinner and then braced Skylar for a very frustrating evening. For a while I've been wanting to write a post about my former therapist, Peggy, but I haven't gotten around to it because TV and Eating and Lazy. But then these people from BetterHelp reached out to me. So, here's a sponsored post about therapy. It all started when a few years ago Brianne barged into my office and said "I made an appointment for you to see a therapist named Peggy." Then she left before I could ask any of the obvious questions. This was offensive. Not because I think therapy is a shameful thing. But because it's always going to be a little jarring when someone out of the blue facilitates the provision of mental health services for you. But I'm 85% afraid of Brianne, so the next Wednesday at 4:30 PM I got into my car and drove across town to see this Peggy person. 3. The thing that happened on Saturday. About three years ago I decided to base 100% of my self-esteem on my yard maintenance. This was a dangerous decision because a weed can send me to therapy now. On the plus side, I can accidentally steal someone's car and get chased down by multiple employees of a car dealership and still think I'm a perfect human as long as my lawn is looking healthy that day.